Buck Marshall taught political science for five years and received his doctorate from Tulane in 1992. After 20 years in the private sector, his reaction to the Occupy Wall Street movement was to write a series of books and establish the non-profit SWIFT Act Alliance. All proceeds will be retained by SWIFT Act Alliance. Buck: First, the book gives you a 15-page overview of what’s wrong with the economy. 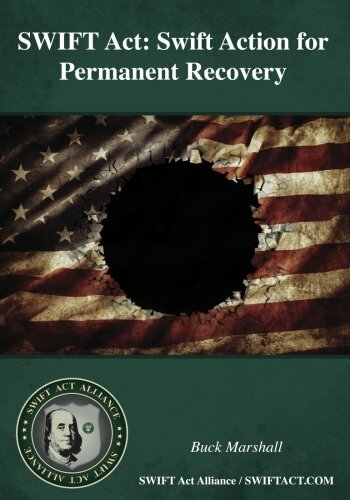 The rest of the book covers five sets of proposals that are fundamental to long-term recovery. These are Smart Growth, Wage Standards, Industrial Policy, Financial Reform, and Trade and Tax Reform. The book is not partisan. Economic problems were created through bipartisan consensus, which will only be overcome through a bipartisan alliance for reform. Buck: This is my first experience. For book sales I’ve pledged 20% of proceeds to the non-profit. At the same time, the book is only $10 on Amazon (less from some outlets), and I couldn’t sell it that cheaply with a publisher. I want people to be able to buy something for $10 that they can read on the subway. Update 2/25/2017: The author has designated all proceeds from book sales to be retained by the non-profit SWIFT Act Alliance. Buck: The website is swiftact.org. A drop-down under the Contact Us tab is “FAQ,” which gives a comprehensive overview of SWIFT Act proposals and why I wrote the book. I’m also working on adding a section where people can log in with twitter or Facebook and leave comments. That feature and SWIFT Act products (T-shirts, bumper stickers, mugs) should be available in the next few months. All proceeds are retained by the non-profit SWIFT Act Alliance.